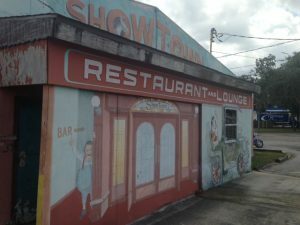 Although many of the sideshow legends are long gone, Gibtown (population: 14,230) at one time served as home to the likes Colonel Casper Balsam, Al “The Giant” Tomaini (who owned Giant’s Fish Camp with his wife Jeanie “Half Woman” Tomaini and were known as the “World’s Strangest Couple”), Alligator Man and Priscilla the Monkey Girl, Dotty the Fat Lady, the notorious Grady “Lobster Boy” Stiles and even Melvin “Human Blockhead” Burkhart (who hammered these huge spikes up his nose), among many others. In addition, special zoning laws were enacted years ago to allow Gibtown residents to keep exotic show animals, carnival rides and other carny-related exhibits on their property. The nearby International Independent Showmen’s Association hosts an annual trade show in February. Directed by Melissa Shachat, Gibtown (2001) is a fascinating documentary of this eclectic community. Note that the 1995 “Humbug” episode of The X-Files (Season 2, Episode 12) although set in Gibtown was actually filmed in Vancouver. Heading to Gibtown? Take Exit 250 off Interstate I-75 and head toward U.S. 41. I strongly suggest you stop by AJ’s on the River for lunch and then check out the International Independent Showmen’s Museum, which is full of fascinating circus-related artifacts, in adjacent Riverview. Don’t miss the Al Tomaini “Boot Monument” on U.S. 41 at the former site of Giant’s Fish Camp. If you are feeling adventurous, grab an ice-cold beer at the Showtown Bar & Grill!